City Rural Insurance Brokers in Adelaide South Australia, was established in July 1995 and over this time has developed specialist brokers in areas ranging from Commercial Motor, Market Stalls, Professional Indemnity, Liability, Business and Arts and Crafts Insurances for clients across Australia. Public & Products Liability insurance specifically designed to cover the needs of Market Stallholders. This policy will provide protection to you, where you have a liability at law for property damage &/or bodily injury to another person. 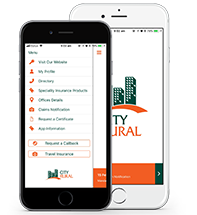 In order for City Rural Insurance Brokers to provide you with an Obligation Free Quote, please complete the following. Location of markets where stall / booth is to be situated. Are any products IMPORTED by you / your business? Are any products EXPORTED by you / your business? all costs awarded against You in respect of Personal Injury or Property Damage happening during the Period of Insurance and caused by an Occurrence within the Territorial Limits in connection with Your Business as an occupier of a stall and/or booth and/or similar space at a market and/or similar gathering where such booth, stall and/or similar space is rented or hired by you. In order to make an informed assessment of the risk and calculate the appropriate premium, your insurer needs information about the risk you are asking it to insure. For this reason, before you enter into a contract of insurance, you have a duty under the Insurance Contracts Act 1984 to disclose to your insurer every matter that you know, or could reasonably be expected to know, is relevant to the insurer’s decision whether to accept the risk and, if so, on what terms. The duty also applies when you renew, extend, vary or reinstate a contract of insurance. If the insurer has waived your obligation to disclose. If you do not comply with your duty of disclosure, your insurer may be entitled to reduce its liability in respect of a claim or may cancel your contract of insurance. If the non-disclosure was fraudulent, the insurer may be able to avoid (or cancel) the contract of insurance from its beginning. This would have the effect that you were never insured. One important matter to be disclosed is the history of losses suffered by the person seeking insurance or any closely associated person or entity. As you are responsible for checking that you have made complete disclosure, we suggest that you keep an up to date record of all such losses and claims.